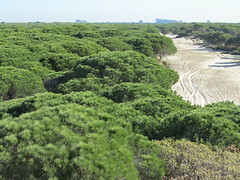 Doñana National Park is a natural reserve in Andalusia, southern Spain. It covers 543 km2, of which 135 km2 are a protected area. 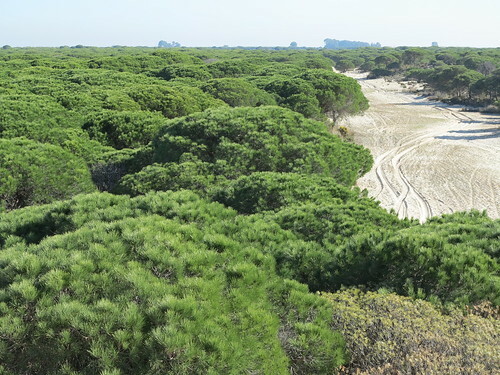 The Parque Nacional de Doñana is one of Europe's most important wetland reserves and a major site for migrating birds.The parque itself and surrounding parque natural or Entorno de Doñana (a protected buffer zone) amount to over 1,300 km2 in the provinces of Huelva, Sevilla and Cádiz. The park is an area of marsh, shallow streams, and sand dunes in Las Marismas, the Guadalquivir River Delta region where it flows into the Atlantic Ocean. It was established as a nature reserve in 1969 when WWF joined with the Spanish government and purchased a section of marshes to protect it. Tourism at that time and the spread of hotels along the beach had been a major threat, but is today well regulated, educated and supportive to the management of the park. There has been a constant threat to the eco-system, that of drainage of the marshes, the use of river water to boost agricultural production by irrigating land along the coast.